Young filmmaker Kamar Ahmad Simon's �Shunte Ki Pao!� (Are You Listening) has been invited to 'Campus Studio Lab' at the 62nd Berlin International Film Festival 2012, according to the filmmaker. The film will be showcased as part of the section, 'Berlinale Talent Campus'. The 10-day festival, one of the most prestigious in the world, will open on February 9. Simon informed that he has been invited to attend the festival, which will give him a chance to exchange views with world-renowned filmmakers and film personalities. He is leaving for Germany today. 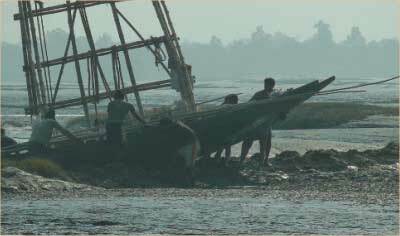 �Shunte Ki Pao!� has already been awarded at last year's 'Asian Forum for Documentaries', held in Kolkata. The film is about a community's struggle to get back the land they have lost. Since the last tidal surge washed away their homes and belongings, they lived stranded on the only existing high land -- an age-old dyke, in the coastal belt of Bangladesh. This is not a film about how painfully they lived ever since, but how they dared to live again. Apart from direction, Simon has also written the story and played the role of DoP (director of photography). Sara Afreen is the producer of the film. Every year 'Berlinale Talent Campus' invites up-and-coming filmmakers in a very competitive selection from all over the world. It offers a networking platform for them. Simon's film was selected out of 4300 applicants from 137 countries. He is one of the organisers of 'Tareque Masud Filmy Bahas'.